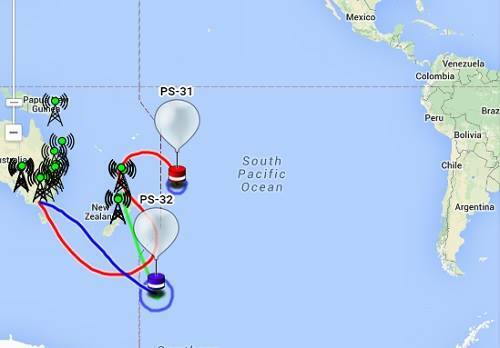 Different paths are being taken by the two solar-powered Australian pico balloons, PS-31 and PS-32, carrying Amateur Radio payloads, each sending 25 mW WSPR and JT9 transmissions alternately in the 10 MHz and 14 MHz bands. Their current position is here. They are each standard 90 cm foil party balloons with a payload that comprises a GPS receiver, two HF transmitters, battery and solar panel weighing a total of just 15 grams. The transmitters for both balloons can be received on standard WSPR dial frequencies of 10.138700 MHz and 14.095600 MHz. For PS-31 these will put WSPR at 1400 Hz-1600 Hz, and JT9 at 1000 Hz, allowing decoding of both WSPR and JT9 without changing frequency on each band. PS-32 has a 1200 Hz JT9 offset so that it can coexisting with the PS-31 transmissions at 1000Hz offset. 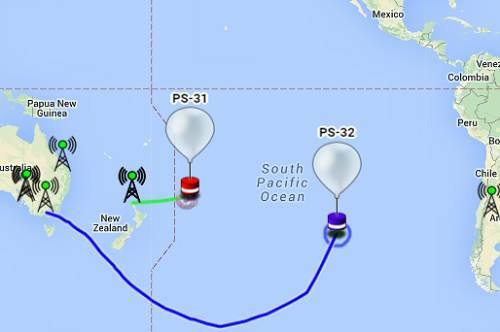 Launched from Melbourne on Saturday, January 24, the balloon PS-31 has now crossed the International Dateline for a second time, at the 23rd parallel in the South Pacific. It formed the letter ‘S’ on its journey that took it to the sub-antarctic in the south, then turned back reaching the north-east coast of New Zealand, and turning again on a more easterly track. It is a third of the way between Australia and South America. Meantime PS-32, launched from Woori Yallock 56 km east of Melbourne three days later, continues to track south-east to by-pass New Zealand on a polar route across the dateline in the Southern Ocean, before traveling around Cape Horn in South America. They are fitted with QRP transmissions give their location, altitude, speed and other data, with PS-31 using the callsign VK3YT while PS-32 is signing VK3ANH. Both are following their predicted trajectory paths in a Jetstream forecast by the National Oceanic and Atmospheric Administration (NOAA). Andy Nguyen VK3YT who launched them, and an international tracking effort, have their fingers crossed that both will at least reach South America. Waiting and listening are radio amateurs using open-source software tools eager to report progress of the southern hemisphere flights. Earlier, PS-30 was launched from Melbourne on December 27. It crossed the African continent entering through Namibia. There it was tracked to near Madagascar before poor weather and lost after 20 days. The small solar-powered pico balloon from Australia went down north-east of New Zealand, probably being hit by rain and ice in the area. Andy Nguyen VK3YT reports that PS-31 gave out its final JT9 packet message and was lost. The balloon, launched from Melbourne Australia on Saturday January 24, maneuvered forming an s-shape but was lost after as dark fell and it was across the International Dateline in the South Pacific. PS-32 with the VK3ANH callsign continues to be tracked. It put up from Woori Yallock 56kms east of Melbourne on January 26, Australia Day, and is currently in the South Pacific. Like all recent balloons in the series launched by Andy VK3YT for the Southern Hemisphere, it is fitted with QRP transmission of both WSPR and JT9 giving trackers the location, speed and altitude along with other data. PS-32 continues being tracked at last report was doing well. An International team of radio amateurs are following its path.